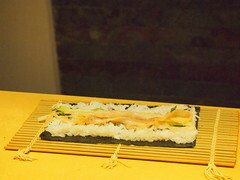 There’s been a bit of a buzz on the ol’ Interweb and Twitter about a new sushi bar opening in Clerkenwell, London. 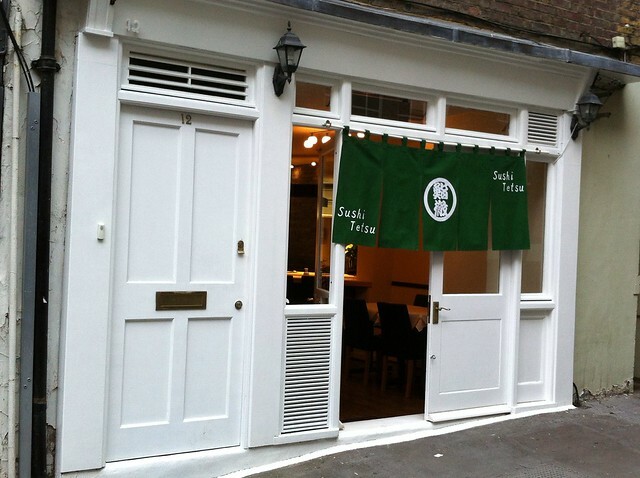 Sushi Tetsu was opened by former Nobu chef, Toru Takahashi and his wife in a tiny place in Jerusalem Passage in Clerkenwell, London. It’s only been open a month, but has already won over most food critics and various foodies in the blogosphere with their authenticity and what’s been described as “the closest thing you’ll get to being in Tokyo”. It’s already established cult status within the foodie world and well, I’m willing to travel for good food.. It was actually a bit of a palaver trying to get there as I initially booked to go with TSW and she was only free on a Monday, and I thought that whilst it was a bit unusual that a sushi place was open on a Monday but booked anyway. Then I read that they get their fish fresh every day from Billingsgate Market so I felt better about going – Until Nick and Lap told me that Billingsgate isn’t open on Mondays, so I began to wonder how fresh the fish was going to be. I mean, as Lap teased, thawed Mekong Delta catfish could be a possibility so with haste, we re-arranged the booking. As luck would have it, I had to go to Londinium for a few work meetings; *KER-CHING!*. A dinner reservation (without TSW who was away for her work) was hastily booked. 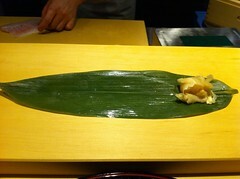 Kicking off the sushi was the turbot; a single nigiri was placed on the bamboo leaf and in I went. 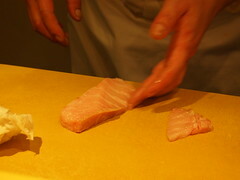 What I hadn’t noticed as I was mesmerised by watching Takahashi-san working was that he had put tiny, fine marks into the fish so that it would absorb the delicate soy seasoning he applied to each piece better (and also helps to break down the fish when you eat it). This happened throughout the rest of the meal and even though you have the option for more soy sauce to dip in your sushi, there really is no need as each piece is perfectly seasoned by Takahashi-san. 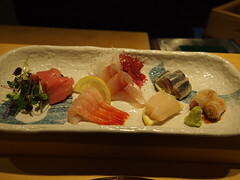 Oh, and the fish was really sensational – sweet and tender – but almost with a slight crunch when you bite into it, I did feel a bit like I had inhaled the nigiri and wondered if I should take my time to savour each bite, otherwise it was going to be a very short visit! 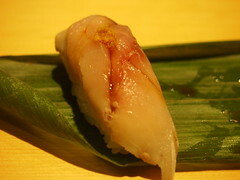 I needn’t have worried because next on offer was Ebi – Shrimp. Now, these are often given a bad rep by Supermarket sushi packs because they only offer cooked fish (longer shelf life, you see), and what you do get is overcooked, bland and texturally is closer to cardboard than to any living organism at all, let alone marine life. But here, the shrimp has already been boiled but not yet peeled – Essential in retaining some of the moisture. 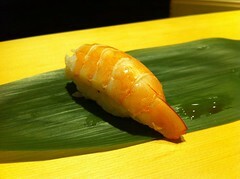 The prawn was so big that it seemed to envelope the rice rather than be perched on top. 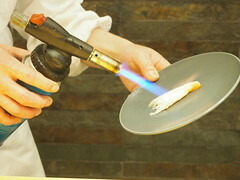 The inside of the butterflied-open prawn was given a quick scorch by a blow torch which not only helped elevate this prawn nigiri above others in terms of temperature, but the slight char it left on the flesh added another dimension to the whole flavour of the prawn – Utterly delicious. 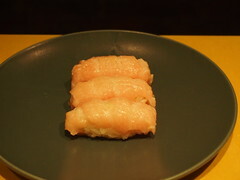 Given how fantastic the Ebi nigiri was, it was interesting to see how tuna nigiri should be done (again, as compared to what you may get from the chilled cabinets of supermarkets). The fish was soft and almost bouncy in texture as you chewed. The rice was warm, soft with a slight hint of vinegar and perfectly seasoned where it was almost creamy when you chewed it. That, combined with the bouncy texture of the fish was a great marriage, especially in the yellowtail and the razor clam which had a satisfying crunch when you bit into it. In fact, the same could be applied to all the sushi which was served to me that night – Astoundingly fresh and high quality fish, each piece prepared with great care and attention you would expect from a sushi chef, perfectly seasoned and draped upon some rice which is not only perfectly seasoned and served at the right temperature so that it’s almost creamy, hand-crafted to perfection, yet rice and fish work together yet against each other. As with all good dining experiences, I was reduced to making guttural noises in appreciation. I tried to take my time and not wolf down as every piece of sushi as soon as Takahashi-san placed it on the bamboo leaf – especially when you see the care and attention he puts into making each piece (not to mention how he perfectly judges the pace of everything too, so you’re never too rushed, nor are you waiting to excessive periods of time in between offerings) – But every single piece was just so delicious, I could see why people are already raving about this place. It helped that the couple whom were also there were lovely and we got to having a decent chat – Even though I asked a near impossible question to answer when I asked “what makes a good sushi bar?” (The answer to which is that it’s completely subjective, some like to eat in complete silence whereas others may like more banter between guests and/or the chef, so there isn’t a definitive answer as such). And then came the o-toro. Oh GOD! The o-toro! 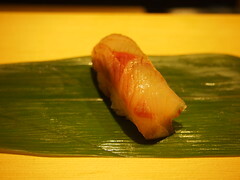 I had known how this is the prized (and most expensive) part of the tuna because it’s the part of the belly which is seriously marbled with fat – And the Japanese know that fat=flavour. I have had midi-toro and chu-toro plenty of times, but I couldn’t actually remember if I had tried o-toro or not in the UK. 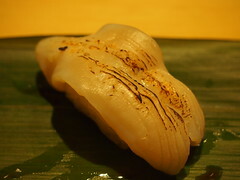 Takahashi-san brought out a slab of o-toro, impossibly marbled with fat so that it was more fat than meat and carefully sliced a piece out and fashioned it on top of some of the delicious rice. 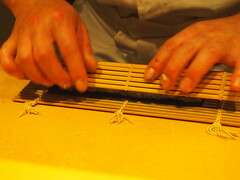 Then, to my surprise, Takahashi-san also charred the o-toro slightly and placed it onto the bamboo mat in front of me. So how was it? Well, it was another Serious Foodie Moment for me; the o-toro was rich and creamy with a slight smokiness from being blow-torched, it practically melted in my mouth before I had to chew the soft grains of rice. 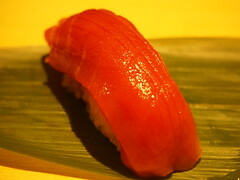 I could easily see why o-toro is so revered in Japan and it had me practically begging for another piece! 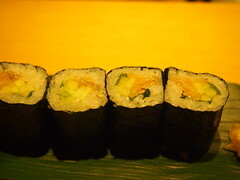 To round things off, the one maki roll was offered. 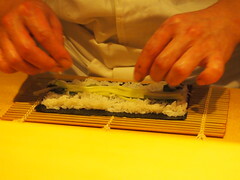 I saw Takahashi-san making the roll with speed and precision but I wasn’t too sure what the main ingredient was (other than the cucumber). When presented, I was told that it was scallop skirt with cucumber and shiso leaf. Well! Who’d have thought that Scallop skirt would be so delicious? The satisfying crunch from the scallop skirt combined with the cool, refreshing cucumber, lightly toasted sesame seeds and minty shiso leaf was an absolute revelation and if you like something different, you should absolutely try this. Then came the killer question from Takahashi-san: “Would you like more?” Mindful of the time as I had a train to catch, but at the same time not really wanting this experience to end, I asked Takahashi-san if he had any eel. 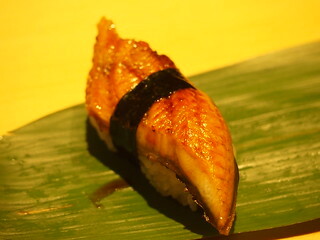 I have to admit, I’m a bit of a sucker for grilled eel and as a consequence, always try to order it whenever I can. However, I was also keen to try the sea urchin given the quality of the fish and asked if I should go for the eel or the sea urchin; to which the reply was to have the eel this time because the quality was much better and also “Jay Rayner’s favourite”. Well, who am I to disagree with Takahashi-san given the quality of food thus far, and also with Jay Rayner (who would publish his review on Sushi Tetsu a few weeks later). 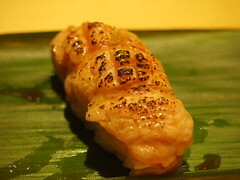 And how I was glad I did here – grilled eel with a thin layer of fat between the crisp skin and meaty flesh with the sweet soy sauce perched upon that killer soft, seasoned rice. I had to pause and savour the moment because it was so damned good. And that’s the thing about Sushi Tetsu: I am (reliably) informed that it’s authentic and as close to something you’d experience in Japan, but a lot of people then state the obvious and say that will never be “truly authentic” or as good as Tokyo because the fish is mainly sourced from Billingsgate – And Billingsgate is no Tsukiji. Well of course it bloody isn’t! And if you’re going to make impossible comparisons, it will never be great. Rather, why can’t we celebrate what we have here; A brilliant new place with exceptionally high quality sashimi and sushi composed of ingredients and resources that are available to the chef. Of course it’s not going to be the same as if you were eating somewhere in Japan, but it’s pretty damn close and makes the most of what is available to us here in the UK. 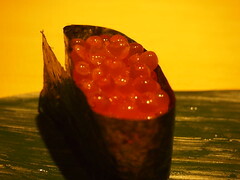 I brought up how I was a bit worried about eating there on a Monday lunch time and Takahashi-san told me (in no uncertain terms) that the fish he got on Monday may not be from Billingsgate, but he had resources which meant that he could still get high quality fish. 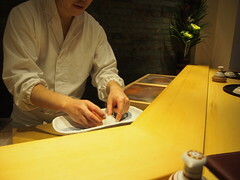 After going to Sushi Tetsu, I completely trust Takahashi-san and am confident that he would not serve any fish that he thought to be substandard (like how he told me not to go for the sea urchin earlier in my meal). In a very Asian way, I wasn’t too sure if I wanted to write about Sushi Tetsu because I am aware that I would only be adding to the hyperbole and deserved praise – Which in turn would mean that it would be even harder to get a table. But, all good things should be shared and if you can bag a reservation (at the time of typing this post, they were fully booked for lunch for 2 weeks and for Fri + Sat dinner for the next 6 weeks), then you absolutely should go. 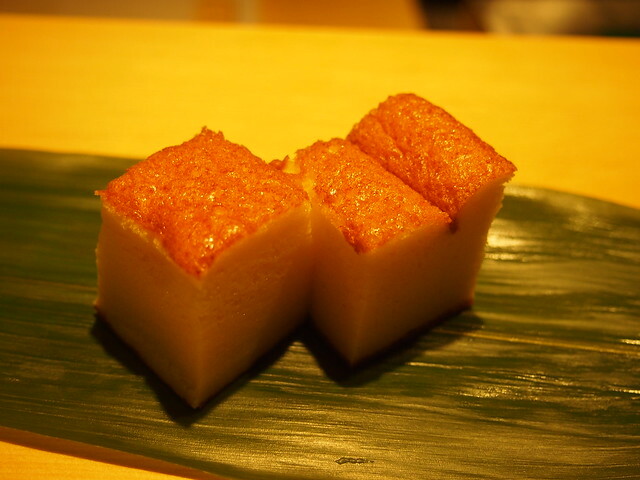 One final thing though; when you are served the tamago at the end of the meal – Just remember that nothing sweet or hot is served at Sushi Tetsu. It’s a small detail but helped cement in my mind how brilliant this place is. I can’t comment on the authenticity and really don’t care how it compares to somewhere in Japan, all I know is that Sushi Tetsu is one of the best places out there for Sushi and Sashimi. This entry was posted in Eating Out, Londinium and tagged Clerkenwell, London, Sushi, Sushi Tetsu, UK on August 15, 2012 by YSL. Looks like a place I need to have a go at! Presentation looks pretty good. I’m looking forward to eating here…. tomorrow! What was the damage on what you you ate? It looks pretty much authentic to what you get at the sushi bars in Tsuikiji market, the only difference are the the extra flourishes with the blowtorch. 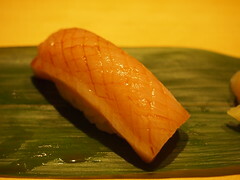 It’s common with otoro but I’ve never come across it with other fish. Yay! at last! Damage for the trip above was £80 including service and tea. But I had a medium sashimi, 8 + 1 roll sushi + unagi + extra O-toro. 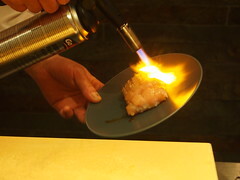 Have you not been to Yashin Sushi where the blowtorch is a (too) common a feature? 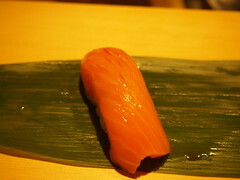 Ouch, that’s like the top range omakase at Sushi of Shiori! Never been to Yashin, i think the location has put me off seems like it may cater for tossers. Have you tried Dinings in Marylebone? Another ex-Nobu chef, pretty good.